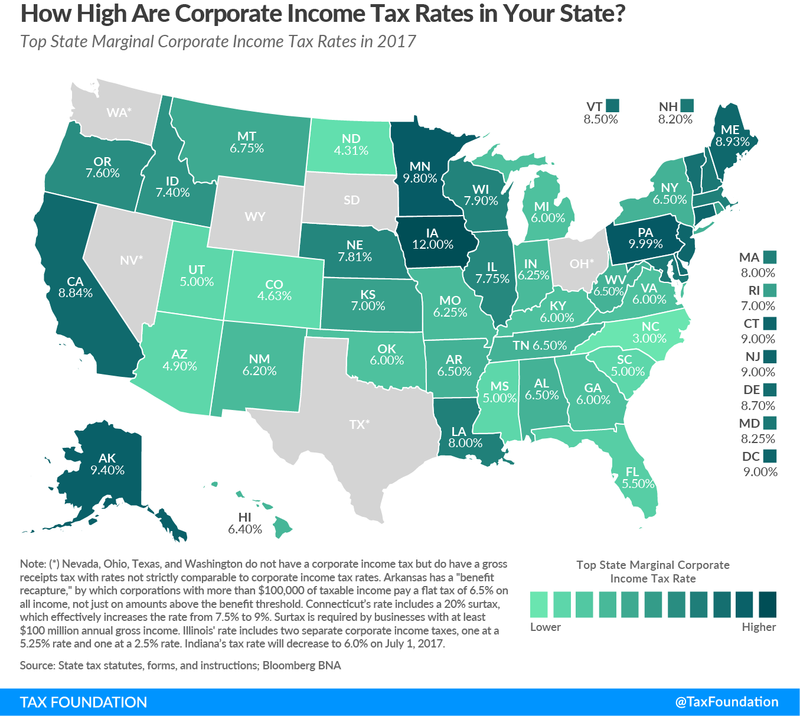 Six states — Alaska, Connecticut, Iowa, Minnesota, New Jersey, and Pennsylvania, and the District of Columbia — levy top marginal corporate income tax rates of 9 percent or higher. Seven states — Arizona, North Carolina, North Dakota, Colorado, Mississippi, South Carolina, and Utah — have top rates at or below 5 percent. Iowa levies the highest top statutory corporate tax rate at 12 percent. Iowa is closely followed by Pennsylvania (9.99 percent) and Minnesota (9.8 percent). Three other states (Alaska, Connecticut, and New Jersey) and the District of Columbia levy rates of 9 percent or higher. Conversely, North Carolina’s flat rate of 3 percent is the lowest rate in the country, followed by rates in North Dakota (4.31 percent) and Colorado (4.63 percent). Four other states impose rates at or below 5 percent: Arizona at 4.9 percent and Mississippi, South Carolina, and Utah at 5 percent. Nevada, Ohio, Texas, and Washington forego corporate income taxes but instead impose gross receipts taxes on businesses, which are generally thought to be more economically harmful due to tax pyramiding and nontransparency. Delaware and Virginia impose gross receipts taxes in addition to corporate income taxes. South Dakota and Wyoming levy neither corporate income nor gross receipts taxes. North Carolina cut its corporate income tax from 4 percent to 3 percent as the final component of the multiyear phase-in of its comprehensive 2013 tax reform package. North Carolina now has the lowest rate of any state levying a corporate income tax, down from 6.9 percent in 2013. Arizona reduced its corporate income tax rate from 5.5 to 4.9 percent. New Mexico reduced its corporate income tax rate from 6.6 to 6.2 percent. The rate is scheduled to fall to 5.9 percent in 2018. The District of Columbia reduced its corporate income tax rate from 9.2 to 9 percent. Indiana will reduce its corporate income tax rate from 6.25 percent to 6 percent on July 1, 2017. The rate will be reduced further to 4.9 percent by 2021. (a) Arkansas has a “benefit recapture,” by which corporations with more than $100,000 of taxable income pay a flat tax of 6.5% on all income, not just on amounts above the benefit threshold. (b) Rate includes a 20% surtax, which effectively increases the rate from 7.5% to 9%. Surtax is required by businesses with at least $100 million annual gross income. (d) Illinois’ rate includes two separate corporate income taxes, one at a 5.25% rate and one at a 2.5% rate. (e) The tax rate in Indiana will decrease to 6.0% on July 1, 2017. (g) The tax rate in New Mexico will decrease to 5.9% in 2018. “State & Local Government Finance, Fiscal Year 2014.” U.S. Census Bureau. http://www.census.gov/govs/local/. Jeffrey L. Kwall, “The Repeal of Graduated Corporate Tax Rates.” Tax Notes (June 27, 2011): 1395, June 27, 2011. 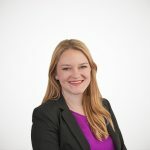 Walczak, Jared, “Nevada Approves New Tax on Business Gross Receipts.” Tax Foundation, June 8, 2015. https://taxfoundation.org/article/nevada-approves-new-tax-business-gross-receipts.